We can’t resist this version! In the history of rock music, it’s pretty difficult to find any musicians who exceeded Rush’s pure and raw talent. The band was known for its musicianship, and ability to compose and perform complex pieces. Rush are also one of the most versatile bands in music history as well, and this video perfectly displays that! In the band’s R30 concert film, the band stripps down one of their most popular songs, “Ressist,” into a beautiful acoustic ballad. 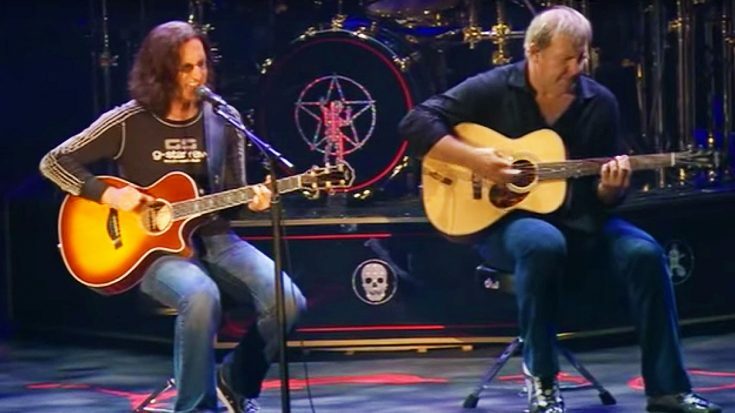 It’s not too often you hear Rush play acoustic instruments, but let me assure you, they sound just as great as they do on electric ones! Fun Fact: Alex Lifeson and Geddy Lee began performing this acoustically on the Vapor Trails tour after Neil Peart performed his lengthy drum solo (“O Baterista”) and released this version on Rush In Rio. This was so popular they repeated it in their set for the 30th anniversary tour 2 years later. Also, the instrument played at the beginning of the song is a hammer dulcimer, not a guitar. Peart wanted to include that instrument on a track. Check out this beautiful version of the song down below, and enjoy!